Last weekend we made our first camping trip of the season at Trippenkennett Farm which lies in attractive countryside in Three Ashes near Monmouth. Our trip was a one night stop over on our way to visit family. It was great to be back outdoors and using our trusty Belltent as we had been impatiently waiting to do so, it being nearly six months since our last camping trip. Of course it is still very early in the season and not many sites are open but Trippenkennett was very much up and running with campervans, motorhomes and caravans being used whilst we were there. 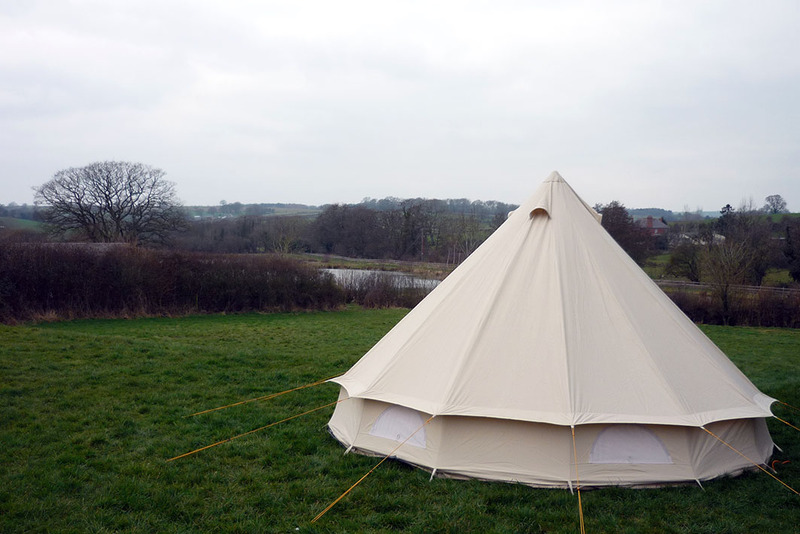 We were the only tent on the site, but we know that the Bell Tent Campers Facebook group met up to camp here the previous weekend so it appears the farm is very popular for such a small site. The scene was still wintry with the first signs of spring just visible and the trip gave us the first try out of some new kit we had invested in over the winter to allow us to extend our camping season. All in all the trip was a great success and we were not cold at night thanks to our new tent inner, and using the electric hook up we were able to use an electric heater to take off the chill in the morning. Thanks to Campfire Magazine, we cooked on our new Anevay Rocket Stove and it provided lots of warmth for us to sit out into the darkness of the evening. A good night and as always provided lots of food for thought for new projects for our next eagerly awaited trip.